Focaccia Faccia! Stuff Your Face with This Tasty Bread! Focaccia Bread Recipe – Great for All Occasions…In the Face! Putting together some focaccia with finely chopped fresh rosemary, garlic, olive oil and a sprinkle of Reggiano Parmigiano from Paggi Pazzo! To start, I buy my dough from a specialty market that makes their dough fresh everyday without any unhealthy oils and ingredients. Now if you have the time, feel free to make your own dough (show off!) but those of you like myself who don’t, here’s how we begin our focaccia recipe. I take a handful of flour and cover both sides of the dough, kneading and prodding to stretch it out. Unlike pizza, I don’t use a dough-roller for the focaccia and instead, poke at the dough all around with both index fingers to create an indented mountainous appearance (how picturesque!). Continue to poke and stretch it out until you have a decent size round shape and then place on a pizza stone or cooking sheet. I then add olive oil all around the focaccia and add a little bit of finely chopped garlic and fresh rosemary, pinch of salt and pepper, then a sprinkle of grated Reggiano Parmigiano. That’s all there is to it my friends! That simple! Set the oven to 425 degrees and it let it bake for about 20 minutes or until the focaccia turns a golden brown and then POW! Focaccia heaven. Recipes and types of focaccia vary from region to region in Italy. The one my mother has taught me is more of a Roman take on focaccia but also common in places like Liguria, while in areas of the south it is not uncommon to find focaccia topped with tomatoes and olives. I sometimes like to make panini with the focaccia by slicing it in half and stuffing with prosciutto and fresh mozzarella and/or soppressata with fresh mozzarella. It’s a reeeeeeeeally good panino, trust me! I use to make them all the time during my college days when I worked at Tutto Italiano, a little Italian specialty store. Try one and you’ll be so busy attacking that focaccia panino that you won’t have any time for TV, even if shark week is on! Now I know some may ask, what’s the difference between focaccia and pizza bianca? And the answer? I have no clue…. Just kidding… The pizza bianca in Rome is very similar to the focaccia with the difference being that the pizza bianca includes toppings while the focaccia is as is but can also be stuffed with deliciousness. Whatever you decide to do with your Focaccia, I bet it will be destined for face stuffing – Buon Appetito! Remove from oven and let sit for 5 minutes before slicing and stuffing your face! 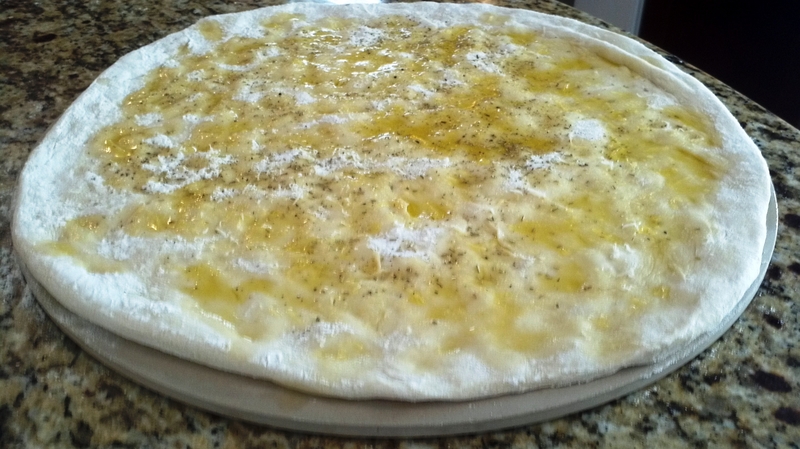 Click here for full Homemade Focaccia Recipe and other Paggi Pazzo recipes. Homemade Spanish Style Crab Croquettes – Fuel Up for a Run Through Pamplona! Spanish Crab Croquettes Recipe; Run with the Bulls Amigos! Tapas from Spain is one of my all time favorites and the Iberian nation is a hotbed for all things tasty! Without a doubt, I can’t have a tapas dinner without ordering some kind of croquettes that feature jamón Serrano, or chorizo, or chicken or beef or fish, etc… It doesn’t really matter because usually whatever is added in the filling is a mouth full of deliciousness! Today I’m sharing my recipe for Spanish Style Crab Croquettes, filled with fresh crab meat, chorizo, Manchego cheese, and fresh parsley that accentuate some of Spain’s most classic ingredients. It will inspire you to sing Red Ships of Spain or visit Pamplona and go running with the bulls! Then again, maybe hold off on that idea and stick to the singing. What I love about Spanish crab croquettes, or croquettes in general, is that they’re fantastic for appetizers or even a whole meal if you make them as large as I do! My father-in-law was gracious enough to offer fresh crab meat that he brought home from the ocean waters of New Brunswick, so I knew what I had to do – like Spain world-class midfielder Xavi Hernandez’s exquisite footwork, I had to perform a clinical croquette recipe (or something like that…). One ingredient however I discovered hard to find was Spanish breadcrumbs as there aren’t many specialty stores featuring Spain ingredients close by to where I live so I made a bit of a bread crumb concoction. I mixed Italian and Japanese panko breadcrumbs with Goya Adobo seasoning and together, it gave a crispy and crunchy flavor to this enjoyable recipe. To begin my Spanish crab croquettes, I start by sautéing the crab meat in a pan with garlic, chopped chorizo and a lot of fresh parsley in Spanish olive oil. Next step is preparing a béchamel sauce with butter, olive oil, flour and milk to create a creamy texture. Start by creating a paste with olive oil and butter melted at low heat, followed by flour and heated milk whisked together. Once the béchamel is ready, I chop Manchego cheese and add all of the ingredients together in a large bowl, stirring well and then placing in the fridge for at least 30 minutes. Now that the filling is chilled, I place my breadcrumb mixture on a large plate and beat an egg in a bowl for dipping. Take your crab croquettes filling and make an oval shape with your hands, then dip in the egg and roll onto the breadcrumbs. That’s all you need to do and keep repeating until all of the filling has vanished. Now I know the traditional way then is to fry or deep fry the crab croquettes and I did just that for 4 of them because my wife and I were very hungry and couldn’t wait to taste! However, for healthy eating best practices, I baked the rest in the oven at 425 degrees for about 10 minutes a side and they came out delightful, not to mention not overly saturated in oil. As a beverage you can’t go wrong with a great glass of Spanish sangria (or jug) but Spain has excellent wines and beers, including the Conde de Valdemar Rioja or the Estrella Damm Beer from Barcelona, or the Mahou-San Miguel from Madrid. All will go excellently with your fresh crab croquettes! You’ll be feeling good and ready after a few of these to take on anything, maybe even a run with the bulls? Just be sure to carry a few extra croquettes in case the bulls get a little too close so you don’t get the horns! Spanish Crab Croquettes recipe from Paggi Pazzo, Viva España! Remove from oven and let rest 5 minutes before serving and shout Viva España!!! Click here for full Spanish Crab Croquettes Recipe or Spanish Chorizo and Manchego Croquettes Recipe and other Paggi Pazzo recipes.